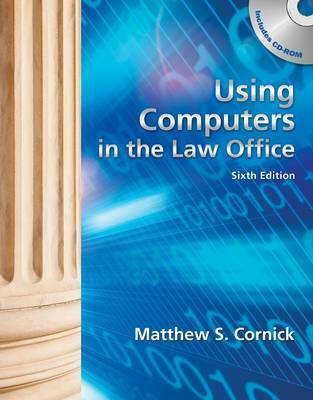 USING COMPUTERS IN THE LAW OFFICE, 6th Edition is the ideal book to provide readers with comprehensive, up-to-date information on the use of technology by paralegals in all types of legal organizations. It describes basic computer concepts as well as more complex skills and software programs with coverage and assignments for Word, Excel, Adobe Acrobat, AbacusLaw, CaseMap, HotDocs, Summation iBlaze, Tabs3, TimeMap, TrialDirector, and more. Using Computers in the Law Office covers important topics such as an updated discussion of electronic discovery, Internet legal/factual research, legal timekeeping and billing, litigation support software, and case management and docket control software. A variety of other topics are covered including WestLaw Next, Google Scholar, mobile computing, document management, security, ethics, the electronic courthouse and many other trends in legal computing. Each topic is presented in a clear and organized manner that includes many examples of how the software is actually used on-the-job. Detailed Hands-on Exercises ensure that readers will gain practical knowledge of these tools by giving them the opportunity to apply what is presented in the book and to practice using computers to complete legal work.